Less than a year ago I didn’t own a single face mask and now I own a good 8-10 of them and use them at least twice a week! These days I’m a huge advocate of face masks and love to use them regularly for their various purposes and a little pamper. I thought I’d share mini reviews of my most used face masks with you. The Good Things Manuka Honey Radiance Face Mask has been designed to help keep skin clear and hydrated. This face mask contains white clay which helps to draw out impurities that can lead to dull and congested skin. I use this face mask by smoothing a fairly thick layer onto my clean face and then leaving it to dry for 10 minutes. Once the 10 minutes are up I use a warm damp flannel to remove the product from my face. This face mask has a lovely light scent of honey and leaves my skin feeling extremely soft, fresh and hydrated. I like to use this face mask when I feel that my face needs some TLC. Good Things Five Minute Facial Mask has been formulated to make skin clearer, brighter and smoother, all at the same time. There’s green clay and kaolin to draw out impurities, avocado oil to moisturise, goji berry extract to soothe and willow bark extract for radiance. After cleansing, I smooth a thin layer of this face mask onto my skin and leave it on for 5 minutes, I then use a warm damp flannel to remove it from my face. This face mask has the most amazing fruit scent which this alone makes using it a total pleasure, but it also leaves my face feeling cleaned, brighter and clearer as I have found it reduces redness from blemishes. I like to use this face mask when my time is limited but feel that my face could do with an all-round fix. The Super Facialist Tea Flower Clay Mask is meant to help unclog congested skin by clearing skin of dirt, excessive oils and toxins which lead to breakouts. This mask contains avocado oil rich in vitamins A, D and E with acacia honey to help skin rebalance itself to reveal a clearer, refreshed-looking complexion. After cleansing, I smooth a generous layer of this face mask onto my skin and leave it on for 5-10 minutes, I then use a warm damp flannel to remove it from my face. This clay mask has a mild floral scent and leaves my skin feeling deeply cleansed, smooth and refreshed – my skin feels completely rejuvinated! This is probably my most used face mask, and I turn to this product when my skin is being particularly problomatic (which has been fairly regularly lately) as I feel that it definitely makes a difference. This face mask contains hyaluronic acid, vitamin E and marine collagen to help replace and retain moisture, provide deep hydration and help the skin’s elasticity. After cleansing, I smooth a thick layer of this face mask onto my skin and leave it on for 5-10 minutes, I then use a warm damp flannel to remove it from my face. A while ago I spotted the Quick Fix face masks on the shelves in Boots and decided to pick a few of them up as they were on offer. The Mega Moisture Gel Mask does exactly what it says on the packaging, it is deeply moisturising and leaves my skin feeling smooth and supple. I reach for this face mask when my skin is feeling dehydrated, which isn’t all that often, but it’s a product in my stash I know I can rely on. The Quick Fix Facials Anti-Blemish Mud Mask for oily and spot prone skin includes dead sea mud, salicylic acid and tea tree oil to help absorb and control oil, draw out impurities and tighten pores and help to treat spots and prevent future blemishes. I have blemish prone combination skin and this mud mask is ideal for my skin type. I use this face mask by smoothing a fairly thick layer onto my clean face and then leaving it to dry for 10 minutes. Once the 10 minutes are up I use a warm damp flannel to remove the product from my face. This face mask leaves my skin feeling smooth and soft and I can really feel it making a difference when my skin is congested. I like to use this as an alternative to the Super Facialist Tea Flower Clay Mask. This Body Shop offering is a 3 in 1 face mask that claims to clean, polish by gently removing dead skin cells and moisturise. After cleansing, I smooth a generous layer of this face mask onto my skin and leave it on for 10-15 minutes, I then use a warm damp flannel to remove it from my face. This face mask has a beautiful oaty scent that smells so good I could literally eat it! When I initially tried this face mask I was expecting it to have a fairly grainy, scrub-like consistency however I have found it’s actually a very gentle scrub. This face mask softens, smooths and conditions my skin leaving it feeling rather radiant. I like to use the Honey Oat 3 in 1 Scrub Mask when my skin is behaving but still want to give my face a boost. 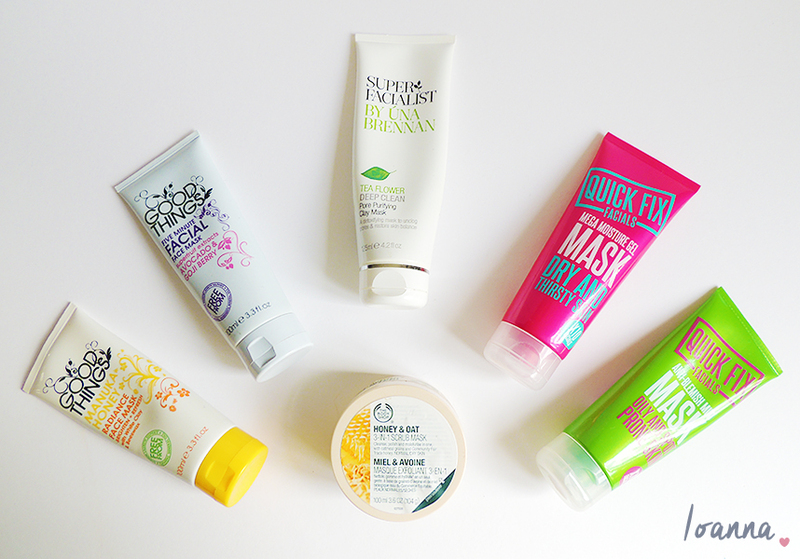 Have you tried any of the face masks featured in this post? What are your favourite face masks?